On Tuesday EKFS members gathered at Hempstead Farm for the annual Stone Fruit walk. Hempstead Farm is situated on the site chosen by Henry VIII's Fruiterer, Richard Harris to grow the strawberries, cherries and other fruits loved by King Henry V111. At the heart of what is now recognised as The Garden of England. Last year G H Dean's Hempstead Farm near Sittingbourne in Kent won the Stone Fruit Orchard of the year in the East Kent Fruit Society's Stone Fruit Competition. The 2018 EKFS stone fruit walk this year was held at Hempstead Farm, Tonge by kind permission of Mr Oliver Doubleday. This included a walk of the winning orchard from the 2017 Stone Fruit Competition. Oliver's son Philip hosted the EKFS visit and conveyed a message of apology from Oliver;" My father is unable to attend as he is fulfilling his role as Chairman of the East Malling Trust, meeting with NIAB to discuss science and research for the industry". Philip also asked for all credit to be given to GH Dean fruit manager David Butler, who expertly manages all the top fruit and cherry orchards, Philip emphasised winning the EKFS Stone Fruit Orchard Competition was primarily down to David's management skills! Heading up the business; GH Dean Director - Oliver Doubleday. Oliver is the great, great, grandson of the company's founder G H Dean. Oliver trained as a molecular biologist and is interested in agricultural and biological research. 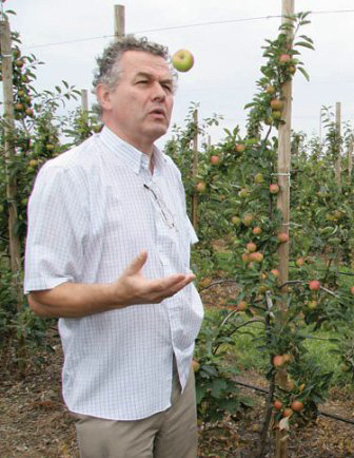 He is a former Chairman of East Malling Research and a director of Rothamsted Research. On Tuesday EKFS members spent a most informative evening in the company of Oliver's son Philip Doubleday. Introducing himself, Philip smiled as he said his degree was gained in Anthropology; clearly father and son have an aptitude for intellectual challenges. Both highly intelligent and endowed with a captivating charm! GH Dean is a private family farming business that was first established in 1922. Today the company farms approximately 1200 ha of cereals and keeps some 2,500 breeding sheep on 570 ha of grass, much of which is unimproved grassland of environmental importance in the Swale Estuary Site of Special Scientific Interest. Introducing the business profile; "The Company has some 200 ha of apples, pears, cherries and plums. The apples and pears are stored in atmospherically controlled cold stores and are packed and marketed by ABB Marketing Ltd producer organisation. We supply major supermarkets locally and nationally, as well as local farm shops and stalls. It is important to us that we continue to support the local community in Kent. G H Dean & Co is a family farming business, originating in the 19th century, with farms located around Sittingbourne. In addition to arable and a breeding flock mainly located on the SSSI marshes the farm grows fruit. The 80 ha of pears and 30ha of Gala apples are stored on the farm". Philip delivered a consummate overview of their expanding 60 hectare cherry enterprise at Hempstead, which has still not reached full production and explained the reason for no protective tunnels used at Hempstead. Highlighting the standard for UK grown cherries - "tunnel protection being the standard for most cherries grown in the UK due to risk of rainfall at harvest time and the high risk of splitting"
Philip said they seek to exploit their local micro-climate with its strong tendency to give them dry summers and have chosen to grow their cherries without the use of covering systems. During the reign of King Henry VIII vegetables, previously considered poor man's food, became increasingly popular with the nobility. The King was especially partial to artichokes, loved fruit and, together with Anne Boleyn, shared a passion for strawberries and cherries. The Garden of England proved a fertile larder for his wants and in 1533, the royal fruiterer, Richard Harris, planted apple and fruit orchards at Teynham. The East Kent 'fruit belt' had been born. While understanding growers in a less accommodating climate (which can be relatively near in distance) favouring protective tunnels, Philip maintained the decision by Richard Harris to choose the area around Teynham 500 years ago is no less relevant today! Philip used the word "terroir" a term used by grape growers in France to describe the advantage of 'favourable' local climatic and soil conditions. Terroir: pronounced - ter-war the environmental conditions, especially soil and climate, in which grapes are grown and that give a wine its unique flavour and aroma: the conditions in which a food is grown or produced and that give the food its unique characteristics. There is a small lab where they can measure various fruit characteristics, such as size, firmness, colour, pedicle retention force, brix and acidity. This information is used to improve their in-field husbandry and modified atmosphere storage techniques. Philip emphasised the lab is used to support the management philosophy, rather than vice versa; he has clearly developed a very close understanding of the varietal characteristics and the ability to judge the precise moment when picking for each variety should take place. Once harvested the pallets of cherries are taken to the Hydro Cooler where the field temperature is removed down to circa 6 degrees centigrade. Hydro Cooling is effective and efficient and removes the field heat faster by bathing the pallets in a flow of ice cold water spayed down by gravity. The added benefit is that the fruit is washed with clean potable water which is treated with chlorine dioxide (this is what water companies use in tap water for purification). The water treatment doesn't introduce any taint that some other chlorination process do. The process is quite simple, a large quantity of cold water is used to drizzle down onto the moving pallets of cherries, and the particle water droplets are of such size that no physical damage should occur to the fruit. Water is cooled down with the use of a "Baudelot" type falling film evaporator set up with sufficient falling film plates sized for the number of pallets with around 300 kg of cherries for cooling. 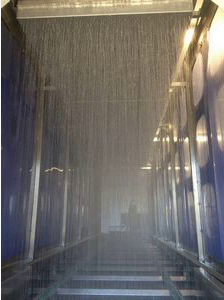 Generally the speed of the stainless steel, chain driven conveyor (that drives the pallets through the water shower) is adjustable. This is to suit the type of cherries being cooled. Various tests which were carried out by a specialist grower have assisted in getting the exact requirements for the construction of the Hydro Cooler. The cherries are then graded into different size and colour/quality grades for despatch to retail customers. For an insight into a cherry grader click on: YOU TUBE CHERRY GRADER this is a library video, not the grader used at GH Dean. Wholesale and import business WT Hill & Sons Imports has begun exports of branded British cherries to Spain and Dubai. 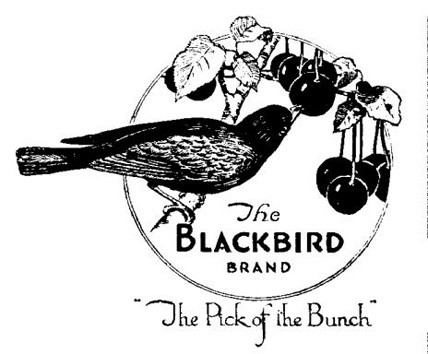 The Western International-based company now supplies the Blackbird brand, owned by Kent grower GH Dean, and its own newly-developed brand Orchard Hill, to Barcelona wholesale market Mercabarna, and to retail chain Spinneys in Dubai. Below: left; Philip Doubleday explaining the single rows allow easier light penetration and more effective spray penetration - and right; the single row format used at GH Dean. Philip explained the pruning management principles, which target two cropping zones; a lower level of fruiting branches and a second level higher up allowing light penetration; the fruiting branches are most productive in the second and third years and removal of stronger wood (3rd year) allowing encouragement of new fruiting laterals forms the basis for tree shape/management; any young (first year) shoots growing in the wrong direction (up or down) can be ripped out during the summer. General pruning takes place after harvest in late summer and tree tops reduced at the same stage. Philip said some pruning (tidy up) is done in early summer. In conclusion, our evening at Hempstead was thoroughly enjoyed by EKFS members and demonstrates the innovation and high management skills operating in the UK fruit industry.